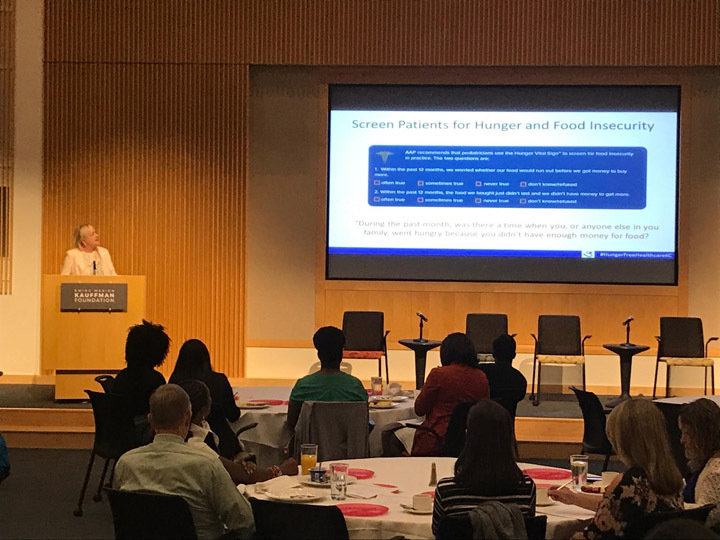 Renee Bryant, Johnson County Department of Health & Environment (JOCO Food Policy Council), shares best practices presented by FRAC and Feeding America at the Hunger Free Healthcare Summit. Trenton Stringer, St. Luke’s Health System, welcomes attendees to the first-ever event. Hunger Free Healthcare KC organizing partners. 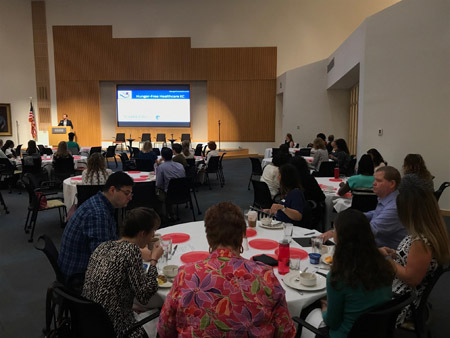 Hunger advocates and health care professionals gathered on September 13 for the first Hunger Free Healthcare Summit in Kansas City. 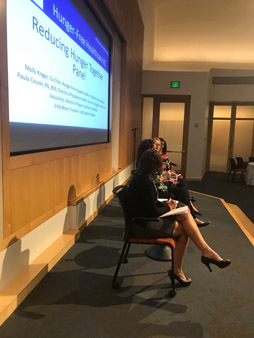 The first-of-its kind summit was an opportunity to discuss the impact of nutrition and food access on health and integrated solutions for patients. The summit was the culmination of nine months of collaborative work between local nonprofits, government agencies, and hospitals. The event was sponsored by The University of Kansas Medical Center and St. Luke’s Health System. Hunger Free Healthcare KC Coalition began with the desire to address food insecurity in our community by a small group of participants in the Health Forward Foundation’s Health Communities Leadership Academy. Beau Heyen of Episcopal Community Services, Trenton Stringer of St. Luke’s Health System, and myself began meeting in January and quickly discovered several community organizations were working on separate projects. 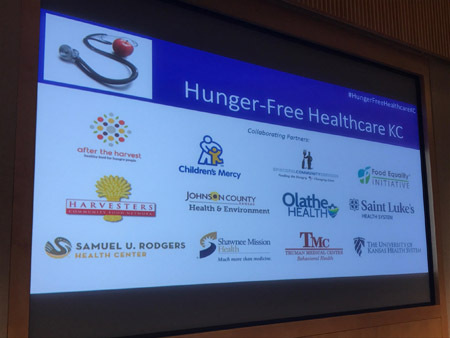 To accelerate best practices and connect health care providers with resources for patients, the coalition grew to include representatives from the Johnson County Food Policy Coalition, Shawnee Mission Medical Center, Olathe Health, Samuel Rodgers Health Center, Harvesters, and After the Harvest. During the summit, attendees heard alarming statistics regarding food insecurity in our city. One in seven individuals in our community is impacted by food insecurity, or the lack of affordable fresh food. 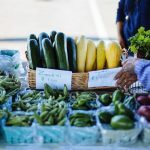 Without access to adequate nutrition, some patients are at greater risk for chronic diseases such as heart disease, diabetes, and kidney disease. Presenters also discussed how food insecurity impacts patients diagnosed with Celiac disease and food allergies, who must maintain a special diet. 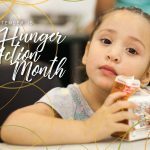 Paula Cousins, Samuel Rodgers Health Center stated, “As a nurse, I told patients to take medicine with food, but never asked if they had food.” “The opposite of hungry isn’t full, it’s healthy,” shared Jessica Kejr of Harvesters. Patients need access to food, but not just any foods, they must be nutrient dense foods. There are many models healthcare providers can utilize to increase patient access to nutritious foods. From in-hospital food pantries, food prescriptions and more, panelist shared insight into local resources available to patients. Molly Krager of Children’s Mercy Hospital (CMH) discussed how CMH is working to meet the needs of their patients by becoming a USDA summer feeding site and prescribing fresh produce. 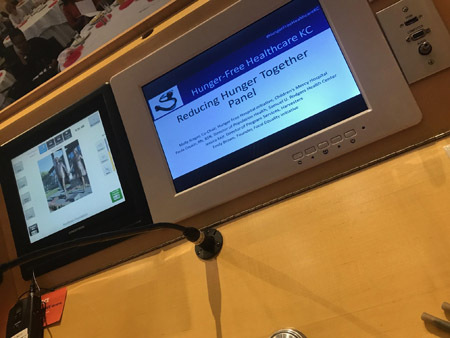 Samuel Rodgers, in partnership with Harvesters, is implementing a diabetes intervention program that will provide a food box, nutrition education, and membership to a local community center. I shared my personal story and the formation of Food Equality Initiative. I discussed the needs of special diet patients, particularly those impacted by food allergies and Celiac disease and encouraged attendees to see patients as partners in addressing their needs. During the last few moments of the summit, attendees were encouraged to network and connect for next steps. 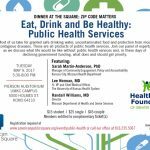 Summit organizers hope the conversation can continue and grow the hunger-free health care movement in Kansas City.